It’s always nice when good sketches sneak up on you. They’re often the ones where you’re not trying too hard or thinking too much. 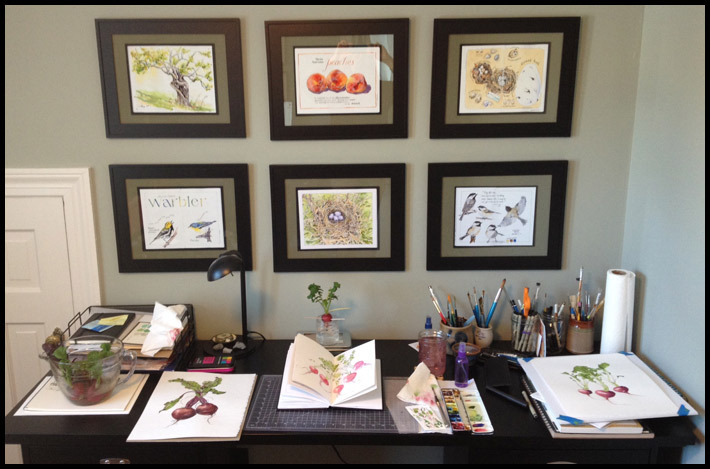 Where your lines are loose and flow from object to paper quickly and without criticism. I wasn’t trying to create anything detailed or complicated here; I just wanted to capture form and light…which, I suppose is what we’re always striving for on paper. Tips & Techniques- If you need to loosen up with your artwork, I recommend grabbing a pencil or pen and leaving the eraser behind. Look at whatever you’re working on for a minute or two, and then jump in. Keep your lines moving and your eyes on your subject. If you don’t like a line, go over it with another one (and another one, and another one). Give yourself just a few minutes to capture the essence. Then turn the page and start again. Do a couple of these quick sketches in succession. When you’re finished, take a read on how it felt to work this way. Freeing, eh? Tomatoes are the new zucchini! One neighbor dropped off a dozen; another went away and left a garden full, ripe for picking. That leaves me eating and painting and looking up new recipes. 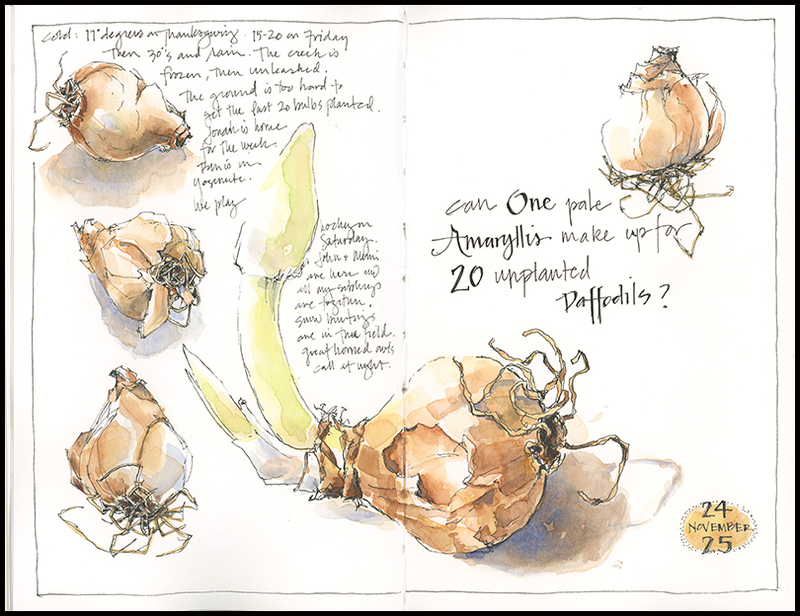 I did the first sketch in my Stillman & Birn journal with Zeta paper, which is a smooth, heavyweight 270 gsm paper. 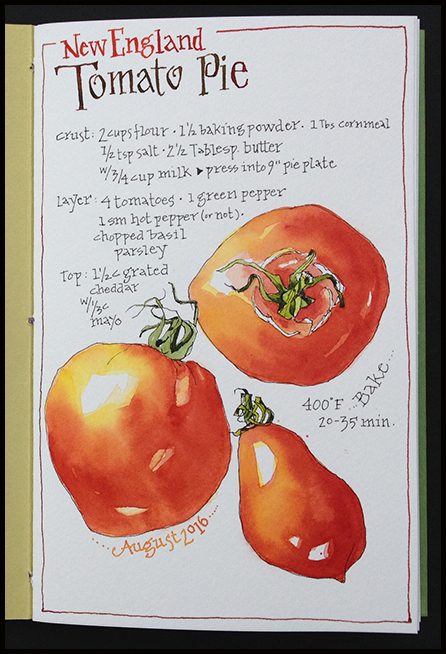 The recipe page is in a homemade journal with Fabriano soft press watercolor paper, which is a dream to work on. 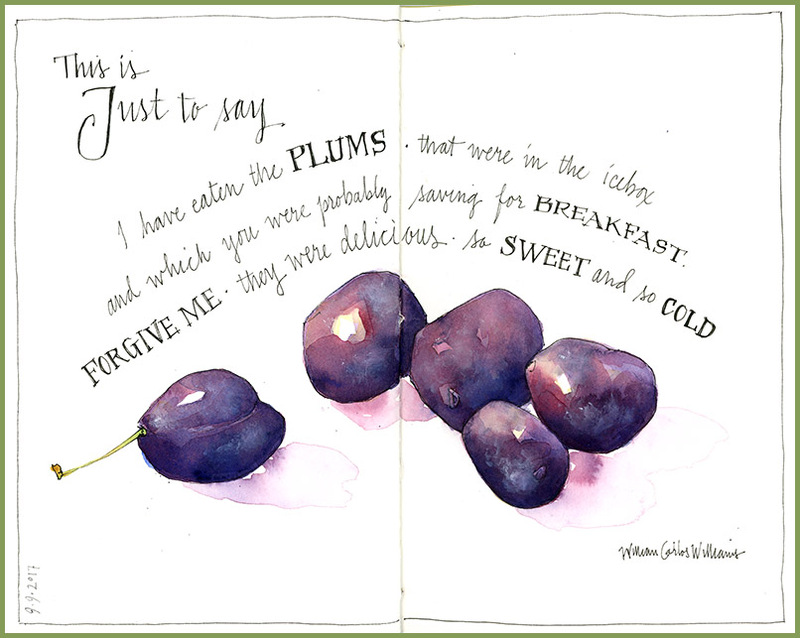 I wrote the main text in watercolor using a dip pen with a drawing nib. If you want to try it, simply load the nib using a watercolor brush. You’ll have to reload frequently, but that will give you a chance to alter the color and get varied tones in the letters. It’s no wonder the bluebird is associated with happiness. This lovely thrush is a harbinger of spring, chattering its warbled song as soon as the days start to warm. I have had the good fortune of seeing and hearing bluebirds frequently over the last few weeks. And whenever I do, I can’t help but feel grateful for its brilliant flash of blue and notes of good cheer. 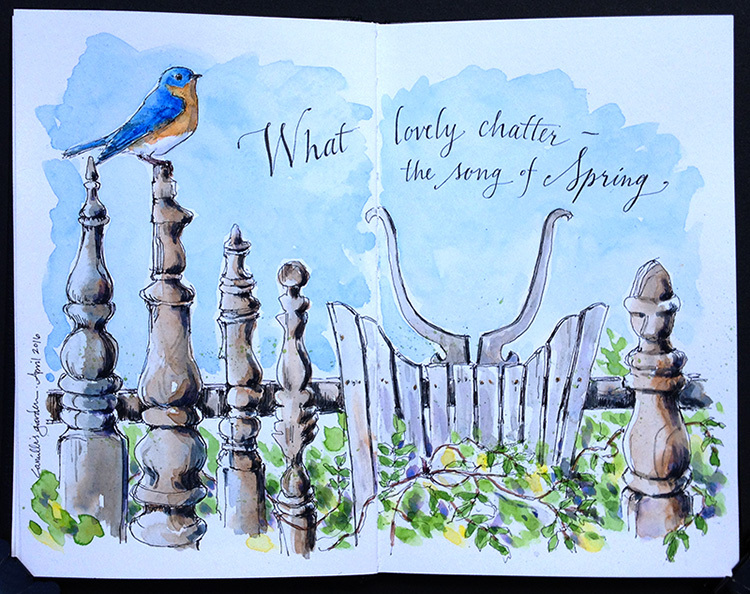 Thoreau was right: the bluebird carries the sky on its back—and glimpsing it is one of the simple pleasures of spring. 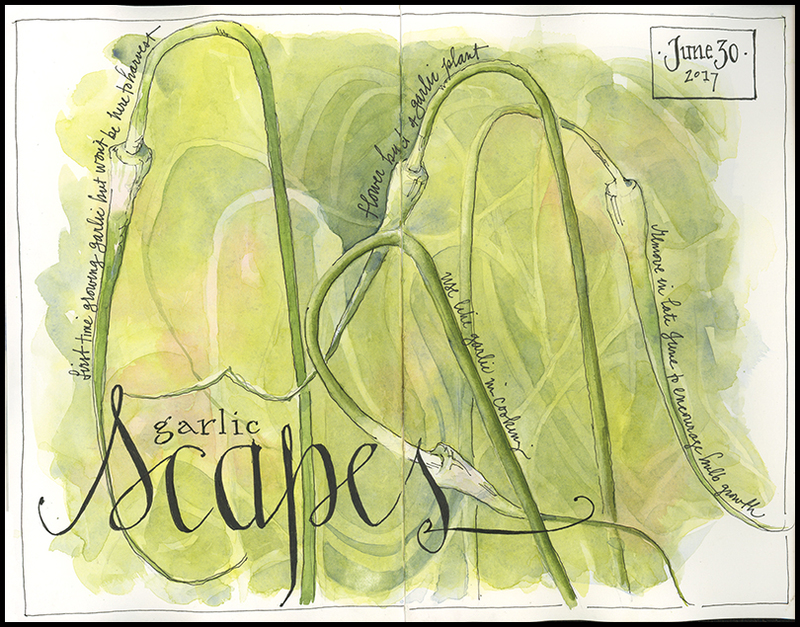 A little more about this journal page: I love this quirky fence. Made of old bed posts by my friend Camille, it makes a great backdrop for her country garden. I was short on time and drawing fast directly in ink, so I didn’t quite get the proportions right. Maybe that was good. I didn’t fuss much with the painting either, which gives it a loose and casual feel…much like the garden and fence. 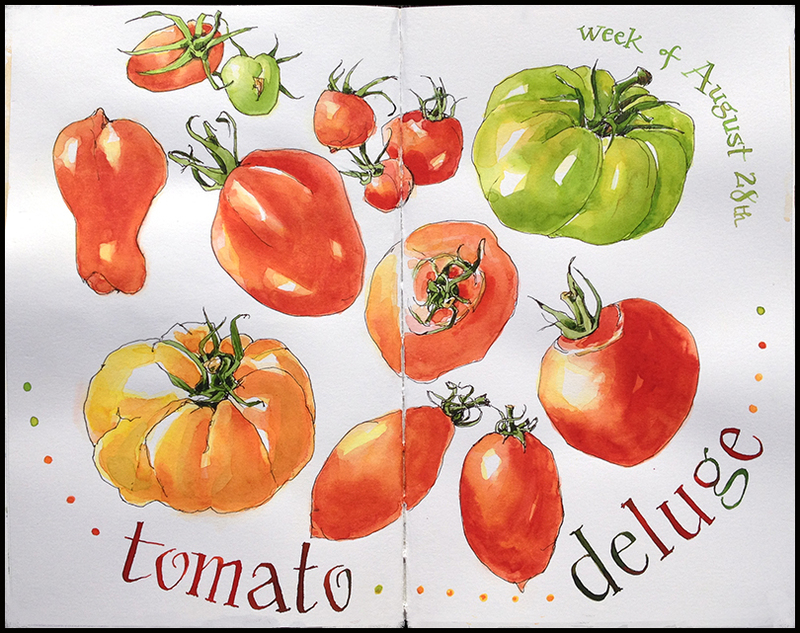 Drawing and text were done with Micron 02 pen with a couple of washes of watercolor in a Stillman & Birn Beta journal. 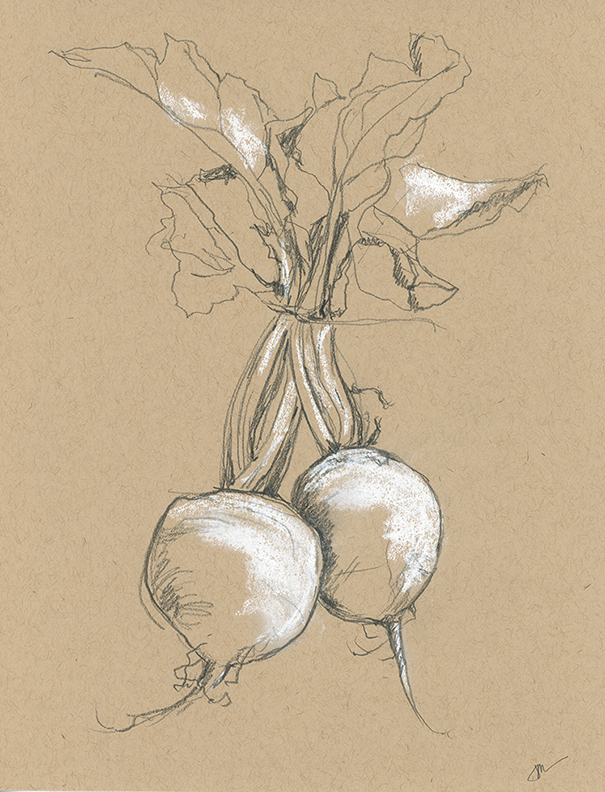 When I first decided to do a series of root vegetable paintings, I had no idea that it would take me so long to finish that the greens would have a chance to wilt, die, and then regrow. After choosing the beets and radishes I liked best, I stuck several rejected vegetables in water and set them aside on the back porch. Then the greens died on my working specimens and I couldn’t finish them. Two weeks later, I discovered new green shoots growing on my reserved vegetables and beautiful, delicate rootlets threading into the water. 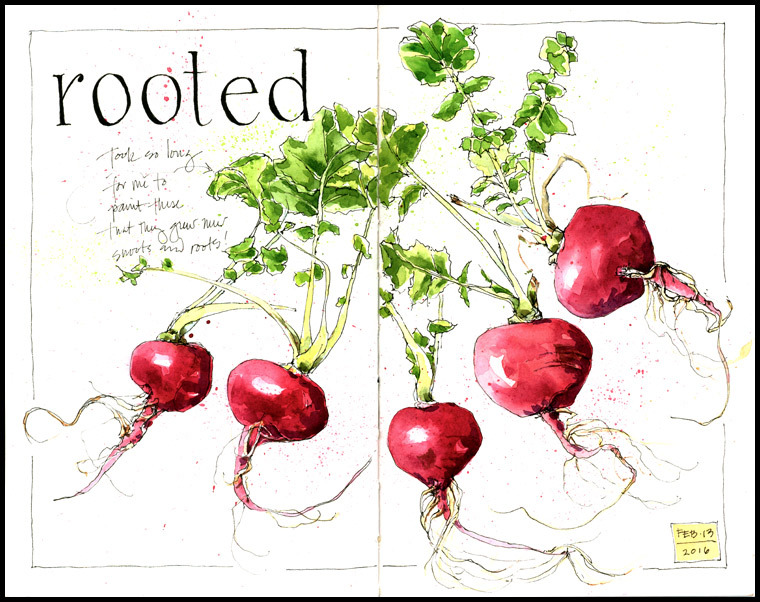 Re-inspired, I have been rooted to my desk ever since, painting beets and radishes and watching lovely greens unfurl. The stems got a little blown out in the scanner. Surrounded by beets and radishes. And one more- quick and loose in the journal (and a little blown out in the scanner). For more roots see carrots and beets.